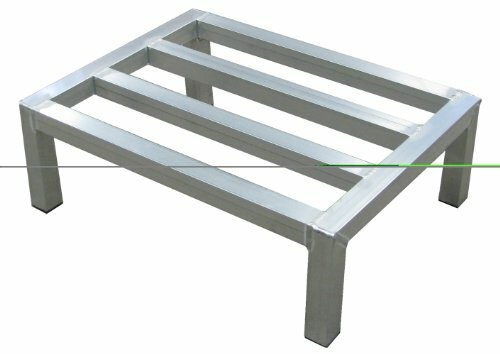 Lockwood DR-2036-12 Aluminum Dunnage Rack, 2000 lbs Load Capacity, 36" Length x 20" Width x 12"
Lockwood dunnage rack, all aluminum fully welded construction. Keeps product of the floor. 1-1/2-inches x 1-1/2-inches corrosion resistant tubing. Assembly is not required. NSF Listed. 2000-pounds load capacity. Measures 36-inches length by 20-inches width by 12-inches height. Lockwood MDR-2460-5 Aluminum Mobile Dunnage Rack with Swivel Casters, 1000 lbs Load Capacity, 60" Length x 24" Width x 8"
Lockwood mobile dunnage rack is made with aluminum. It helps to move heavy products with ease. It is available with 2 swivel casters of size 5-inches x 1-1/4-inches with 2 brakes. Standard load capacity is 1000-pounds. Assembly is not required. NSF Listed. Measures 60-inches length by 24-inches width by 8-inches height. 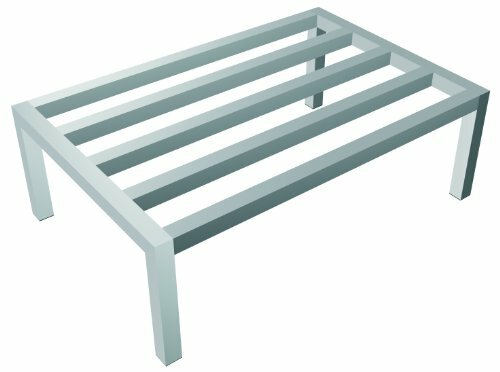 Lockwood DR-2048-12 Aluminum Dunnage Rack, 2000 lbs Load Capacity, 48" Length x 20" Width x 12"
Lockwood dunnage rack, all aluminum fully welded construction. Keeps product of the floor. 1-1/2-inches x 1-1/2-inches corrosion resistant tubing. Assembly is not required. NSF Listed. 2000-pounds load capacity. Measures 48-inches length by 20-inches width by 12-inches height. Lockwood DR-2448-12 Aluminum Dunnage Rack, 2000 lbs Load Capacity, 48" Length x 24" Width x 12"
Lockwood dunnage rack, all aluminum fully welded construction. Keeps product of the floor. 1-1/2-inches x 1-1/2-inches corrosion resistant tubing. Assembly is not required. NSF Listed. 2000-pounds load capacity. Measures 48-inches length by 24-inches width by 12-inches height. Lockwood MDR-2448-6 Aluminum Mobile Dunnage Rack with Swivel Casters, 1600 lbs Load Capacity, 48" Length x 24" Width x 9"
Lockwood mobile dunnage rack is made with aluminum. It helps to move heavy products with ease. It is available with 2 swivel casters of size 6-inches x 2-inches with 2 brakes. Heavy duty load capacity is 1600-pounds. Assembly is not required. NSF Listed. Measures 48-inches length by 24-inches width by 9-inches height. Lockwood MDR-2460-6 Aluminum Mobile Dunnage Rack with Swivel Casters, 1600 lbs Load Capacity, 60" Length x 24" Width x 9"
Lockwood mobile dunnage rack is made with aluminum. It helps to move heavy products with ease. It is available with 2 swivel casters of size 6-inches x 2-inches with 2 brakes. Heavy duty load capacity is 1600-pounds. Assembly is not required. NSF Listed. Measures 60-inches length by 24-inches width by 9-inches height. 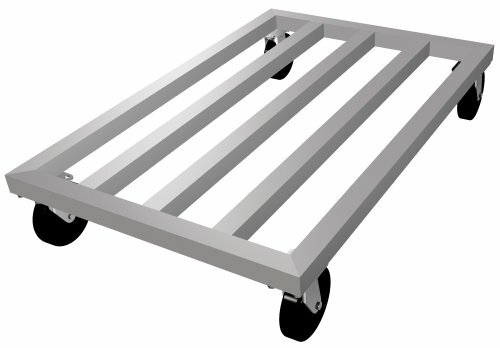 Lockwood MDR-1848-5 Aluminum Mobile Dunnage Rack with Swivel Casters, 1000 lbs Load Capacity, 48" Length x 18" Width x 8"
Lockwood mobile dunnage rack is made with aluminum. It Helps to move heavy products with ease. It is available with 2 swivel casters of size 5-inches x 1-1/4-inches with 2 brakes. Standard load capacity is 1000-pounds. Assembly is not required. NSF Listed. Measures 48-inches length by 18-inches width by 8-inches height. This Dunnage Rack (ROY DR 2036) is made of aluminum and is NSF listed. It measures to: 20 x 36. Also Welded with Plastic Foot. It is composed of pure quality features and has proven to be a well oriented item. 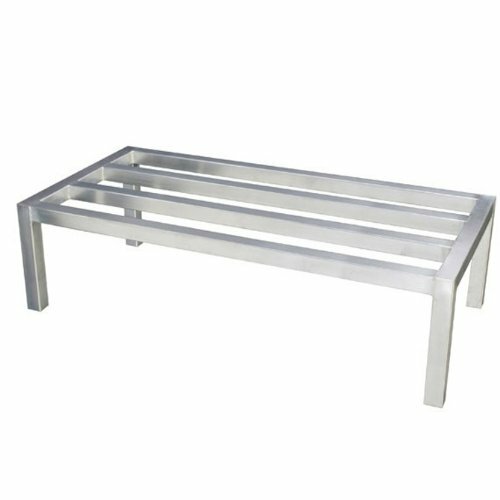 Lockwood DR-2436-12 Aluminum Dunnage Rack, 2000 lbs Load Capacity, 36" Length x 24" Width x 12"
Lockwood dunnage rack, all aluminum fully welded construction. Keeps product of the floor. 1-1/2-inches x 1-1/2-inches corrosion resistant tubing. Assembly is not required. NSF Listed. 2000-pounds load capacity. Measures 36-inches length by 24-inches width by 12-inches height. Lockwood MDR-1860-5 Aluminum Mobile Dunnage Rack with Swivel Casters, 1000 lbs Load Capacity, 60" Length x 18" Width x 8"
Lockwood mobile dunnage rack is made with aluminum. It helps to move heavy products with ease. It is available with 2 swivel casters of size 5-inches x 1-1/4-inches with 2 brakes. Standard load capacity is 1000-pounds. Assembly is not required. NSF Listed. Measures 60-inches length by 18-inches width by 8-inches height. Looking for more Lockwood Dunnage Rack similar ideas? Try to explore these searches: Oliver Tractor Parts, Light Havana Polarized Crystal, and Red A-Line Dress. Shopwion.com is the smartest way for comparison shopping: compare prices from most trusted leading online stores for best Lockwood Dunnage Rack, Jeep Cherokee Mirror Lh Driver, Small Standard Circles, Dunnage Lockwood Rack . Don't miss this Lockwood Dunnage Rack today, April 20, 2019 deals, updated daily.